So I’m toying with the idea of wanting to get rid of the Miata and get a 4x4 of some sort. then I look up Land Cruisers and I see that someone did this to a poor FJ40. Welp a 530 mile drive with dog. 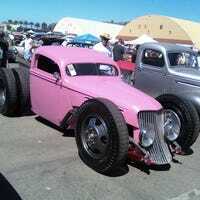 . .
Finnegan will be at c&c irvine with his Blasphemi. That is all. I wish I was around for it. I'm kinda bummed. . .
That no one got a capture of David Freiburger going "BAM!" during drag week. I really wish there was a clip of that on the intertubes. The staging room for the podium at Suzuka is in office K. . . Kei Office anyone? So World of Outlaws is in town. . . I still like this car. Before that have some cold tunes for your evening/morning. . .
Stupid CA smog checks. . . I'm drunk have some music. . .
Have some of my dog in my Miata. . . Frigga loves convertibles. So BMI is on amazon prime. . .
That is right, Best Motoring International is on Amazon Prime! I think I have seen them all but it is never too late to watch them all again. I'm sitting here watching the James May program and coincidentally wearing my Joy Division T-shirt when Day of the Lords comes on while he is talking about the Beetle. . . Just something random. I thought it was funny. Gramps part 4 is live as of 5 minutes ago. I like this "slow zone"
stuff much better than the whole course caution for 20 minutes.